More than 12,000 fans came out to the DCI Atlanta Southeastern Championship presented by Lake Oconee and Greene County, GA at the Georgia Dome on Saturday, July 25. The Blue Devils wowed the crowd jumping two points within a 24 hour period, and continued their undefeated run this season. The Cavaliers also stood alone in second place with a 93.45, putting a solid point's worth of breathing room between the Green Machine and Carolina Crown. Crown also made waves, scoring 92.60, to slip by the Santa Clara Vanguard (4th, 92.00) and Holy Name Cadets (5th, 92.55). It's still anyone's race in both the World and Open Classes, and as corps make their final push to the World Championships in Indianapolis, you won't want to miss a minute of the action! 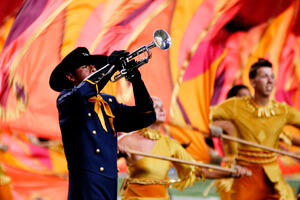 View photos from the DCI Southeastern Championship. Find out how you can be part of next week's World Championship excitement! Photos by Craig Olear.